The reports of the Oriole’s demise have been greatly exaggerated. Yes there are the stat-sheets and theorems and analyses that say the Orioles will not stand a chance. Baseball Prospectus pegs the Orioles as a 74-win team next year. “Hogwash,” I say. “Humbug,” I cry! “Bullfeathers,” I add. The Orioles unlikely rise to the postseason in 2012 completely flipped the narrative on this team in a shockingly abrupt manner. And what a narrative it was. The Orioles are not supposed to be good. They haven’t been good for more than a decade. They were supposed to make slow-steady baby steps toward contention. They were supposed to trade Adam Jones and consider trading JJ Hardy and Matt Wieters to build a young, hungry Tampa Bay Rays-like team. They weren’t supposed to come out of nowhere, do something that hasn’t been done since the Roosevelt administration (the Teddy Roosevelt administration), and make the postseason. It did not makes sense, it flew in the face of modern baseball analysis and therefore it must be a complete fluke. All of that is true. 100% true. The Orioles won an exorbitant amount of one-run games. They won way too many extra-inning games. And those wins, which are essentially coin-flips, the Orioles would not have made the playoffs. After all they beat the Pythagorean Win-percentage by more than 10 games, that is an unheard of amount of luck that is extremely unlikely to be replicated. 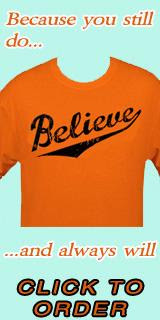 But that is not why the Orioles of 2012 will resemble the Orioles of 2013. I contend that people are getting too lost in the surface of the numbers. If you scratch the surface a little deeper you see a different narrative. Yes Virginia, the Orioles can compete next year and can go back to the playoffs. If anyone out there who reads this has known me for long enough they will most likely be shocked at the words that they are about to read: I am at a loss for words. I, James Clayton Baker, have run out of things to say. Honestly, it has been difficult to write this winter. Since my last post, which ironically was one of the most popular posts I have ever made, the Orioles had a quiet offseason, spring training has begun, Baltimore experienced a useless un-snowy winter, my life as an educator continued to roll along, and I discovered the importance of the Oxford comma. More importantly, I just haven't felt compelled to write recently. Yes, life has certainly gotten in the way and duties both personal and professional will always take precedence over that which is essentially a hobby. I never hoped to spin these internet ramblings into any sort paid gig or new career. Of course if the corporate hivemind over at MASN WANTED to give me my own weekly call in show - well I'm all ears. No, I started this on a whim in college and as I typed those words I just realized that was seven years ago. Which is probably the true source of my lack of production; how many times have I written essentially the same article over the last seven years? Every year about this time I usually jot off some sort of missive defending the Orioles. The article would go on to say while they are most likely to finish in the bottom half of the division things could happen, things could not happen, things could change and the planets could align and the Orioles could do better. Different year, the same article. The names change, the numbers change but it is essentially the same thing.